Follow the Money - going, going, gone? Here I go again. I fully admit being a complete nincompoop when it comes to financial understandings – especially when the number of zero's is more than two. I expect that not really understanding money is a good part of the reason that I don't have much. I have love and security though, which might be a rationalization but more than makes up for it to me. Being a dumbfutz never stopped me from commenting before. On this one, I'll give you my thoughts and depend on your expertise to straighten me out. OK? I am an unabashed gold fan. Gold goes up when security goes down. It is the currency of choice for those who really need to protect against the worlds increasing instability. But the last 2 months, gold has been very humdrum while the world's insanity has done anything but diminish. In my timid voyages into the Dow-Jones financial pages, Bloomberg and Morningstar, I get hints but few firm understandings. It seems that, in order to stabilize the stock market, and to encourage investors confidence to invest in stocks, there has been a concerted effort to sell considerable gold reserves from Central Banks around the world to dampen investors rush to gold and precious metals. Still, I haven't written about it because it is so vague and possible supposition on my part. I can't swear the following chart is related but it seems logical. 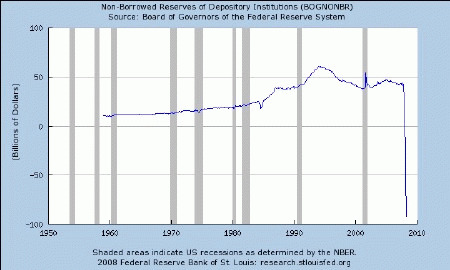 It is the Federal Reserves listing of the available reserves in depositing institutions from about 1958 through May 1, 2008. Do go to the source as they offer the same chart in different ways of viewing the information. Another Fed source with just the actual current numbers can be found at http://www.federalreserve.gov/releases/h3/Current/. I would definitely be open to an education here. Precipitous would be one word to describe such a drop in actual Federal Reserves. What it means, overall, I can't say but it doesn't look good! The Surge is, er, Working! ?